Sandygate Garage, car hire for 1938. Homepage. This page: £6 payable to a Mr Harold Barker of Sandygate Garage for eight days car hire in 1938. Mr H. Barker, of Sandygate Garage, Sandygate Road in Sheffield charged a grand total of £6 0s 0d for the hire of a pre-war saloon car from August 13th to 21st, 1938. Sadly the make and model of car isn't given. In addition to hiring out self-drive cars, he could also supply wedding cars, and fix up your motor-car if it had suffered a malfunction of some kind. Flat wireless battery sir? no problem, Mr Barker offered accumulator charging. 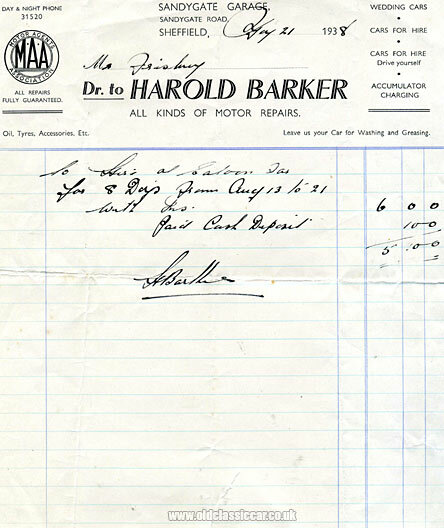 All car repairs were fully guaranteed, and he was a member of the Motor Agents Association (as were many of the old garages in the 1930s, invoices and receipts from a number of similar such emporiums can be found in this collectables section of the site). Whatever happened to Sandygate Garage? It didn't appear in the RAC handbook for 1928/29, nor in the 1949/1950 handbook, so either wasn't in business at those times, or else wasn't RAC-approved. There seem to be no current or past references to a company of this name online, in that location. There is a company called Sandygate Motor Services Limited operating out of 286 Sandygate Road, so perhaps they are using H. Barker's old premises? Or perhaps the location of his pre-war garage at any rate. Does anyone remember this garage? More items of motoring ephemera, including a sizeable collection of garage-related items similar to that shown above, can be found in the Motoring Collectables section.